Adedapo is president of the Nigerian Publishers Association and an executive committee member of the International Publishers Association. He’s bringing his national organization and the international group together on Wednesday in an effort to build regional support for publishers in Africa, his daylong seminar titled Publishing for Sustainable Development: The Role of Publishers in Africa (PDF). “First and foremost,” he says, “in one of our meetings with the International Publishers Association (IPA), we talked about how having a sustainable market can mean producing quality content in all formats—and making our work accessible” to a fast-globalizing industry. “When I go to IPA events,” he says, “I don’t see many black people or brown people.” And, conversely, he points out, his local and regional associates in Africa can be slow to realize the importance of reaching out to markets in other parts of the world. Coming together, in other words, takes effort on both sides. That mistrust, he says, is being bred by piracy. “Authors see their work everywhere,” Adedapo says, and then they expect to be paid royalties for all the sales being made of those books, only to be told by publishers that many of those sales weren’t of legitimate copies. No money has come back to the publisher from a bookseller for the sale of a pirated book. Needless to say, this is hardly what any author wants to hear, nor what any publisher wants to have to say. And the entire industry can find itself in a staring match over perceived lost royalties because the copyright framework isn’t strong enough to protect rights holders. A tradition of pirated content has become deeply established in the marketplace. His association colleagues in Nigeria and the IPA’s administration in Geneva say they’d like to see this be the first instance of an annual event, with the seminar moving from one publishing hub to another in Africa each year. In this case, the seminar will run parallel to the Nigeria International Book Fair, which is scheduled for May 7 to 12 at Lagos’ Jelili Adebisi Omotola Hall. On the event’s slate of more than 25 speakers are Cassava Republic Press founder Bibi Bakare-Yusuf, as are the United Arab Emirates’ Sheikha Bodour bint Al Qasimi, and the IPA’s Michiel Kolman, José Borghino, and Kristenn Einarsson; Nigerian author Chimamanda Ngozi Adichie; Samuel Kolawole, managing director and CEO of Ibadan’s University Press; Brian Wafawarowa, president of the Publishers Association of South Africa; Elliot Agyare, president of the Ghana Book Publishers Association; the Book Buzz Foundation’s Lola Shoneyin; and Ghanan publisher Akoss Ofori-Mensah. In preparatory comments released by the IPA, Kolman sets the tone this way: “This seminar reflects the importance of the African publishing industry and its potential in terms of both cultural and economic progress. The topics up for discussion not only highlight the challenges being faced; they also explore a diverse set of possible solutions. And in his answering comment, Adedapo in his formal statement calls the event “extremely important for the International Publishers Association, the African publishing industry, and Nigeria in particular. “Not since the 29th International Publishers Congress, held in 2012,” Adedapo writes, “has there been a more important international event that focuses on the significant progress the African publishing industry is making. Publishing, literacy, and access to books are prerequisites for success in life and the development of our countries and continent. In conversation with Adedapo during London Book Fair, however, it becomes apparent that on the ground in Nigeria, copyright and intellectual property protection issues–piracy–are uppermost in many minds in the industry at the moment. The last panel of the day in Lagos should have keen interest from the audience, and is devised, the seminar’s information says, to look at how “highly localized customs, police, and industry coordination is required to enforce copyright and intellectual property laws.” While the seminar’s printed materials seem to step around the term piracy, Adedapo does not. As recently as mid-April, an article in PM News wrote of how Yemi Adebiyi, chair of the Association of Nigerian Authors, has called on the federal government in Lagos to crack down on book piracy with stronger laws against it. Young writers, Adebiyi said, are being discouraged by the lack of legal protection for their work, and that in some cases booksellers, themselves, have been known to collaborate with printers on pirated copies of books. It’s unclear at this writing how much representation at the seminar on Lagos on May 9 will include writers, although it seems that their voices could be helpful in describing the gulf of misgiving that Adedapo is describing. When the University Press’ Samuel Kolawole joins the conversation, he tells Publishing Perspectives that one hope for Wednesday’s seminar is that representatives of the Lagos government will attend and will hear the conversation about the critical need for protection against piracy being interpreted and voiced by the international industry. “And it’s not just inside the country where piracy is an issue,” Adedapo says. “You also have it on the international scene” when pirated content from Nigeria and other parts of Africa is sold overseas. 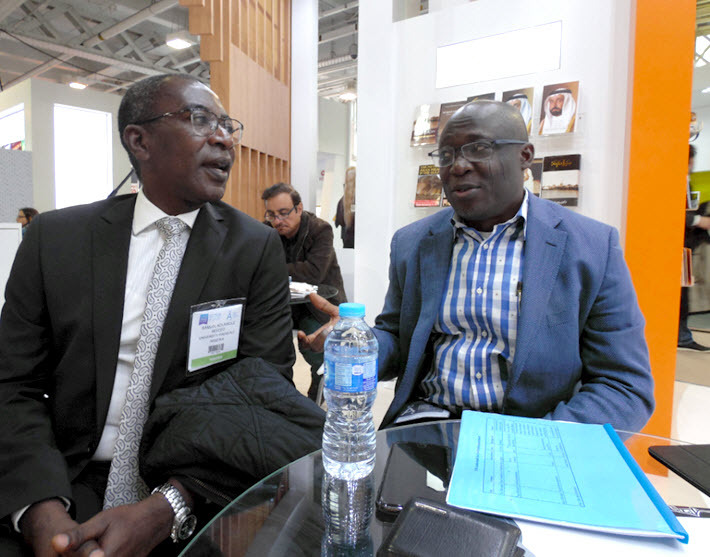 The IPA Nigerian seminar has the support of the Emirates Publishers Association; Sharjah Publishing City; Emaar Properties PJSC; the London Book Fair; National Aviation Services; the American Association of Publishers; the Norwegian Publishers Association; and the Frankfurter Buchmesse.